Offering design rooms with free Wi-Fi, Room@Bangkok Boutique Guesthouse is surrounded by shops and restaurants in shopping area Sukhumvit Road. The cosy guest house is a short stroll from Asoke BTS Station. Rooms and en suite bathrooms with shower are colourful, featuring a unique design and artistic furnishings. They are equipped with air conditioning, a TV and a fridge. Guests will find complimentary bottled water, coffee an tea at the lobby. 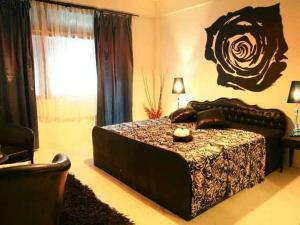 Room@Bangkok Boutique Guesthouse provides safety deposit of valuables at the front desk, and it offers luggage storage. The hotel is a short walk from Sukhumvit Subway Station and Time Square shopping area. Weekend market Jatujak Market is 25 minutes away by BTS train, and Suvarnabhumi Airport is a 50-minute drive away. Please note that the property does not have a elevator. It may not be suitable for elderly or guests with limited mobility. Please be informed that the reception is open during 09:00-18:00 hrs. All non Thai citizens must show original passports at check-in. Drivers licenses and copies from original documents are not accepted. This property will not accommodate hen, stag or similar parties. Colourful design room featuring artistic furnishings, a flat-screen TV and a fridge. Please note that this room type has no capacity to accommodate extra beds. Rate: THB 1080.00 ... THB 1490.00; select dates below to get current rates. Colourful design room featuring artistic furnishings, a flat-screen TV and a fridge. This single room has air conditioning and cable TV. Please note that this room type has no capacity to accommodate extra beds. Rate: THB 850.00 ... THB 1490.00; select dates below to get current rates.